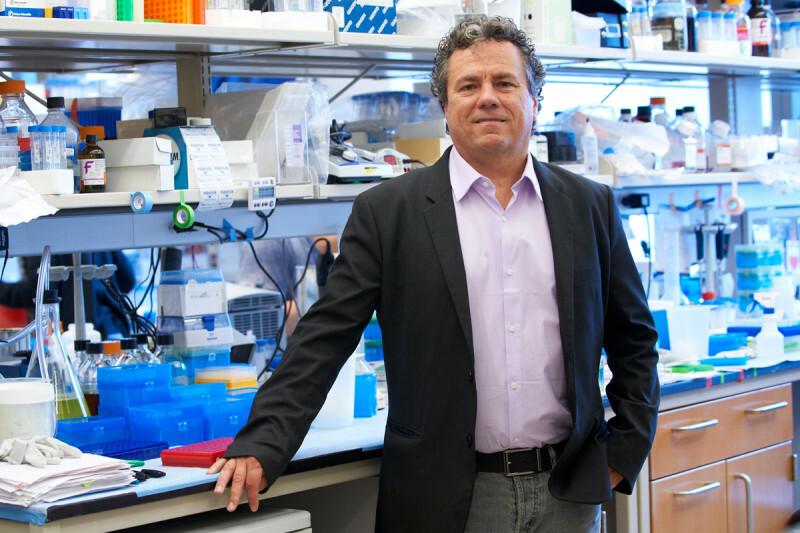 Biologist Scott W. Lowe, Chair of the Cancer Biology and Genetics Program and the Geoffrey Beene Cancer Research Center, is an expert on the processes that naturally inhibit cancer development. A Howard Hughes Medical Institute investigator, Dr. Lowe joined Memorial Sloan Kettering Cancer Center in 2011, after working at Cold Spring Harbor Laboratory for more than 15 years. We spoke with Dr. Lowe about his research in 2012. Can you describe for us your area of research? It’s been known for decades that cancer arises as cells acquire alterations in oncogenes — genes that when mutated may cause a cell to survive and divide indefinitely. But mutations in oncogenes do not inevitably cause cancer. Normally, cells are able to “fight back” against oncogene activity through genes called tumor suppressors. When activated, tumor suppressor genes may trigger cells to self-destruct through a process known as apoptosis or to halt their own growth through a process known as senescence, preventing uncontrolled cell proliferation and cancer development. Our laboratory investigates apoptosis and senescence, and how the disruption of these mechanisms may lead to the development of cancer. In addition, we have found that mutations in tumor suppressors can reduce the effectiveness of some chemotherapy drugs. In investigating this phenomenon, we hope to shed new light on why some tumors become drug resistant and to discover more effective therapeutic targets. We are developing a number of methods including gene manipulation technologies, animal models, and genomics approaches to investigate how tumors develop or respond to therapy. Can you give an example of how such methods are being used? Today, in large-scale genome sequencing projects, scientists are rapidly generating enormous amounts of data on which genes acquire mutations in human tumors. However, we still need to do functional studies to elucidate which of these mutated genes actually influence the development of cancer, and which are the best targets for new therapies. Investigations aimed at understanding the biological significance of specific gene changes have traditionally been very slow. I feel fortunate to be working with people who think very deeply about different aspects of cancer and cancer therapy. My colleagues and I have developed mouse tumor models in which genes can be temporarily and reversibly shut off, allowing us to quickly monitor the function of many genes at a time. In a recent study, we used this approach to screen 300 genes that have been linked to lymphoma through genomic studies, and were able to establish that 12 of these genes, when shut off, may promote tumor development. These genes represent novel tumor suppressors, which potentially could offer new opportunities for therapy or diagnostics. Tell us about an experience that has had a big impact on your career. I did my PhD in Boston, at the Massachusetts Institute of Technology [MIT], in the lab of cancer biologist H. Earl Ruley. About halfway through my training, Earl left Boston while I, reluctant to relocate, continued my research in the lab of MIT researcher David E. Houseman. At first, I worried I had made the wrong decision — my project seemed somewhat disconnected from what the rest of David’s team was working on. But soon enough, I found myself in an auspicious situation as I was being mentored by three amazing scientists: David, Earl, and cancer geneticist Tyler Jacks, who at the time was starting up his lab at MIT. Working together, the four of us made compelling discoveries in studying p53, a tumor suppressor gene that is mutated in more than half of all tumors. Our findings clarified how p53 normally induces apoptosis in response to DNA damage, preventing the survival and proliferation of malignant cells. Furthermore, we found some of the earliest evidence suggesting that a tumor’s genetic makeup can influence its response to therapy. This was an original concept at the time, though it’s a major research focus today. These early findings helped focus my research on trying to understand how cancer development influences therapy response, and to develop therapeutic strategies that exploit mutations in cancer cells. It also taught me the value of interacting with people who have diverse interests and expertise. What motivated you to join Memorial Sloan Kettering? What I appreciated most about Cold Spring Harbor Laboratory — where I started my lab in 1995 — were my colleagues, a group of outstanding scientists who have had an enormous influence on my research. One aspect of this involved the occasional opportunities I had to work with oncologists, who often asked questions that made our research feel more relevant. Craving more of these interactions, our lab moved last year to Memorial Sloan Kettering — a place where basic scientists and clinicians join forces all the time. We have already initiated a number of exciting collaborations with both clinical and laboratory investigators. I feel fortunate to be working with people who think very deeply about different aspects of cancer and cancer therapy, and who are extremely helpful in sharing their expertise and knowledge. It’s equally rewarding that my lab is able to help researchers here answer important questions by sharing our expertise and the technologies we’ve developed. What is the best part of being a scientist? When I started my lab, I had a tendency to imagine it was my job to churn out ideas that other team members would explore. Eventually, I woke up to the realization that the best ideas rarely come from me, but usually from my students and trainees. It is my job to help develop these ideas further, and help place their importance in the bigger picture. My main motivation is to create an environment that supports others in developing and nurturing their ideas. Working with my lab members is a lot of fun, and watching them succeed is extremely satisfying. Can you talk about the Geoffrey Beene Cancer Research Center [GBCRC] and how it supports translational research at Memorial Sloan Kettering? The GBCRC assembles a dynamic and multidisciplinary faculty, and supports us in moving promising science discoveries toward clinical development — with the ultimate goal of making cancers more curable or manageable. The philosophy that inspired the creation of the GBCRC incorporates three principles that are close to my heart. First, the center supports innovative science, providing significant funds to investigators to pursue their best ideas. Second, it fosters dialogue and collaboration between scientists — for example, by hosting retreats and other community events. Because innovation tends to be serendipitous, an interactive environment increases the likelihood that the right people and circumstances will come together and make it happen. The third concept is to give junior scientists, postdoctoral fellows, and students the resources and support they need to test new ideas without delay — before these ideas become outdated or irrelevant. Our young investigators are the future, and supporting their careers and inventiveness is especially critical today, when research funding is dwindling through other sources. What scientific challenges do you think cancer researchers will be grappling with in the coming years? I worry about the tremendous complexity of cancer. There are hundreds of cancer-associated genes, and the function of some of these genes varies in different tissues or under changing biological circumstances. In addition, tumors are heterogeneous — meaning, they are populated by many types of cancerous and noncancerous cells that have distinct molecular profiles and behavior. In order to develop effective and durable strategies to control the disease — while getting to the bottom of drug resistance and other therapeutic problems — we need to reach a higher level of understanding about these issues of biological complexity and context. How long will it take us to get there? The good news is that we’re making great progress in developing the experimental tools that are necessary to study complex and interrelated networks of genes and biological pathways more quickly and systematically. I’m confident that we’re moving in a direction that will allow us to step up and meet these challenges in the near future.